Confession time: I’m never really much of a PSP guy. I know, there’s that vast library of top-notch games to consider, and the fact that six years on, the PSP still is the gadget to beat when it comes to portable gaming. Although, personally, I’m stupid enough to go for the iPod touch just for the handheld version of Street Fighter IV. Waiting – very impatiently, I might add – for the 4th generation to come out this September. Sony “could” announce PSP2 at E3. PSP2 NDAs have been in place at publishers and developers for many months. The PSP2 is based on a four-core Cell CPU. That’s just… wow. Powerful stuff there. There have been “finished units” in the UK, but there aren’t any confirmations about this just yet. 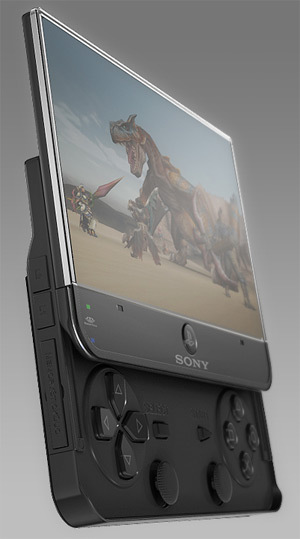 The PSP2 could be released late 2010 or 2011, depending on the source. Multiple PSP2 games are being made in Britain right now. The picture above isn’t the PSP2, but rather a mockup. I wouldn’t mind it going in that direction. And if they manage to get touchscreen gaming right, imagine how amazing that will become. Heck, I’d even drop all my iPod touch dreams just to go for the PSP2. But remember, these are all rumors, so you better take it with a grain of salt.